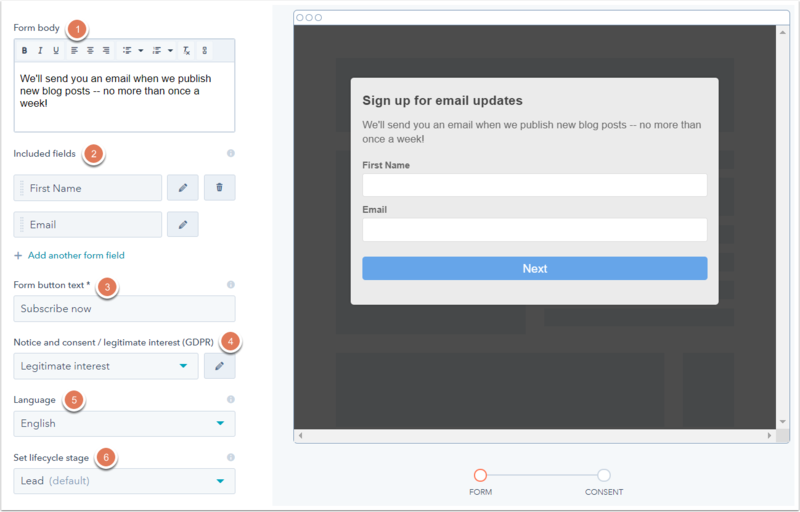 With the pop-up forms tool, you can easily create engaging lead capture forms to attract new leads. 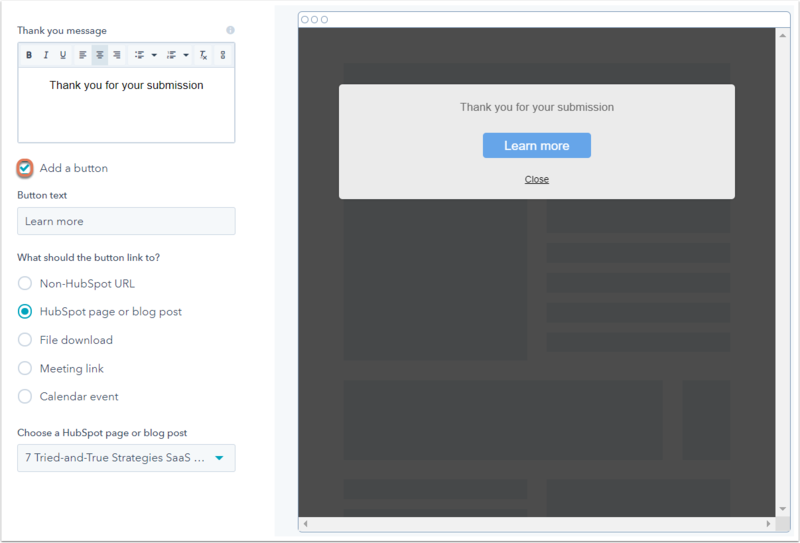 Pop-up forms are available for any blog post, landing page, or website page hosted on HubSpot. To add pop-up forms to an external page, you must install the HubSpot tracking code on your external site, or install the HubSpot WordPress plugin on your WordPress site. In the upper right, click Create form. In the left sidebar, select Pop-up form. In the upper right, click Next. To customize the name of your pop-up form, click the pencil icon edit at the top and enter a name. Pop-up box: appears as a pop-up box on your page. Dropdown banner: appears as a dropdown banner from the top of your page. Slide-in box left/right: appears as a slide-in box from the bottom left or right of your page. On the Callout tab, add and customize a callout to grab your visitors' attention. Featured image: (pop-up box only, optional) select a featured image to display on both the callout and form step. Callout text: the main header on the callout. Callout body: (optional) additional information or details on the callout. Callout button text: the callout form button text. Theme color: set the theme color for your pop-up form. Click one of the default color bubbles, or select a custom color by clicking the color bubble next to the hex value and selecting a color from the gradient, or entering a hex value. Any callout customization will immediately appear in the preview on the right, so you have an idea of what your pop-up form will look like when it's live on your page. On the Form tab, customize what your visitors see when they click the pop-up form button. Form body: (optional) add body text to elaborate on the value you're providing with your pop-up form. Included fields: the default Email field is automatically included. To add additional fields to the form, click + Add another form field. Pop-up forms support the following field types: single-line text, multi-line text, dropdown select, single checkbox, number, date picker, and file. To customize the way a form field appears to visitors, click the pencil icon edit to edit the field label, add placeholder text, or enter a default value. For the Email field, you can specify email addresses and domains to block. Form button text: the form button text from the Callout tab will automatically carry over into this field. To make any changes to the button text on the form step, update it here. Notice and consent / legitimate interest (GDPR): if you have GDPR enabled in your HubSpot account, you can set the notice and consent option for this pop-up form. To customize the default text, click the pencil icon edit. Language: set the form language. You can change the language of the non-editable parts of the pop-up form, including the form field labels. It's currently possible to translate these parts of the form to French, Spanish, Japanese, German, and Brazilian Portuguese. Set lifecycle stage: choose the lifecycle stage contacts who submit the pop-up form will have. This is set to Lead by default. On the Thank you tab, enter a thank you message for your visitors to see after they submit your pop-up form. Use the rich text editor to include some lightly formatted text, or link your visitor to additional resources or downloads. You can add a button after your thank you message to redirect your visitors elsewhere, such as to a web page, file download, or meeting link. Select the Add a button checkbox. Non-HubSpot URL: redirect visitors to an external page. Enter the Non-HubSpot URL of your page. HubSpot page or blog post: redirect visitors to one of your HubSpot pages or blog posts. Click the Choose a HubSpot page or blog post dropdown menu and select a published HubSpot page or blog post. File download: redirect visitors to a file download. Click Browse files to select a file from your file manager. To upload a new file, in the bottom left of the right pane, click Add file downCarat and upload a file from your device, Dropbox, or Google Drive. Meeting link: allow visitors to schedule a meeting with someone on your team using a meeting link. Click the Meeting Link dropdown menu to select an existing meetings link. Calendar event: allow visitors to add a new calendar event to their Google or Outlook calendar. Enter an event name, date, time, timezone, location, and details. On the Follow up tab, create a follow-up email that your visitor will receive after submitting your form by clicking Create follow-up email. Please note: CRM Free users must complete an email setup wizard to enable double opt-in for pop-up forms. Sender: click the Sender dropdown menu and select the sender of your follow-up email. Subject: add a subject for the follow-up email. Email body: add email body text to continue engaging your contact. Click Edit email footer to customize your company's name and address in your email configuration settings. Pop-up form location: set targeting rules to control which pages your pop-up forms will appear on. To set criteria based on a URL, click the first dropdown menu and select Website URL. To show the pop-up form on all pages, click the second dropdown menu and select is all pages. To show the pop-up form only on certain pages, click the second dropdown menu and select is, begins with, or contains and enter your criteria. To pair a parameter and its corresponding value, click the first dropdown menu and select Query parameter, then enter the rule. For example, to display the pop-up form on pages where the URL includes the UTM campaign parameter ebook offer, enter the rule utm_campaign = ebook_offer. To add another rule, click Add rule. Form triggers: select the user action that will trigger the pop-up form to appear. On 50% page scroll: the pop-up form appears when a visitor scrolls 50% down your page. On exit intent: (pop-up box only) the pop-up form appears when a visitor's mouse moves to exit the browser window. After elapsed time x seconds: the pop-up form appears after x seconds have passed (minimum of 7 seconds). Scheduling: (Professional and Enterprise accounts only) to schedule a pop-up form so it is only active from a specific date, select Schedule for later. To publish the pop-up form on a specific date and time, use the Start date and Time dropdown menus. To unpublish the pop-up form on a specific date and time, select the Set unpublish date and time checkbox, then use the End date and Time dropdown menus. Small screen sizes: to disable your pop-up form on mobile devices, select the Turn off pop-up form on small screen sizes checkbox. While pop-up forms are mobile optimized, it's recommended to disable them on mobile. Show dismissed pop-up form again after: click the dropdown menu to set the amount of time that should pass after a visitor dismisses the pop-up form before they can see it again. Add contacts to Salesforce campaign: if you're using the Salesforce integration, click the dropdown menu to associate any contact who submits the pop-up form with a Salesforce campaign. Add contacts to GoToWebinar: if you're using the GoToWebinar integration, click the dropdown menu to register any contact who submits the pop-up form for a specific webinar. When contacts are captured, send email notifications to: click the dropdown menu to enter an email address, or select a user or team. Send opt-in emails: to manage double opt-in settings for your pop-up forms, click Manage in settings. 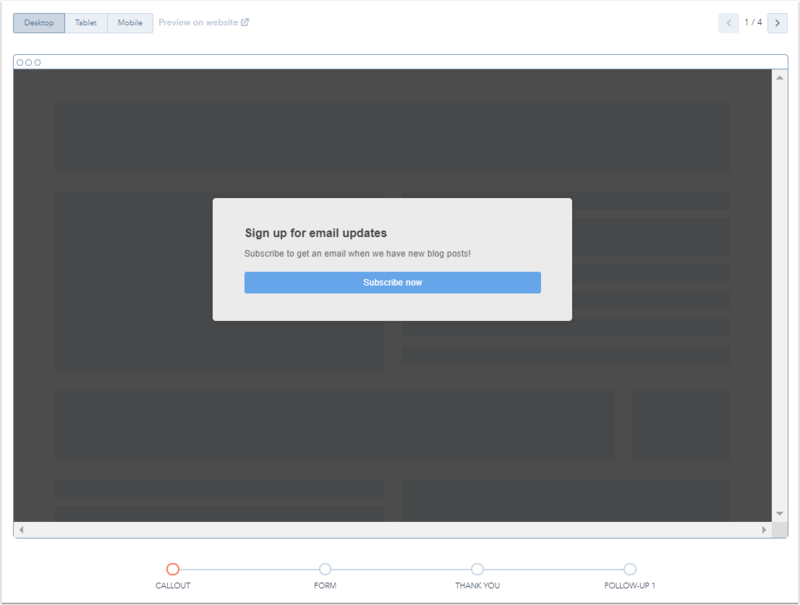 Follow-up subscription type: click the dropdown menu to select a subscription type for your email send. Push new contacts to your email provider (optional): to set up an email provider to push contacts to, click Manage in settings. Learn more about pushing contacts to MailChimp lists. 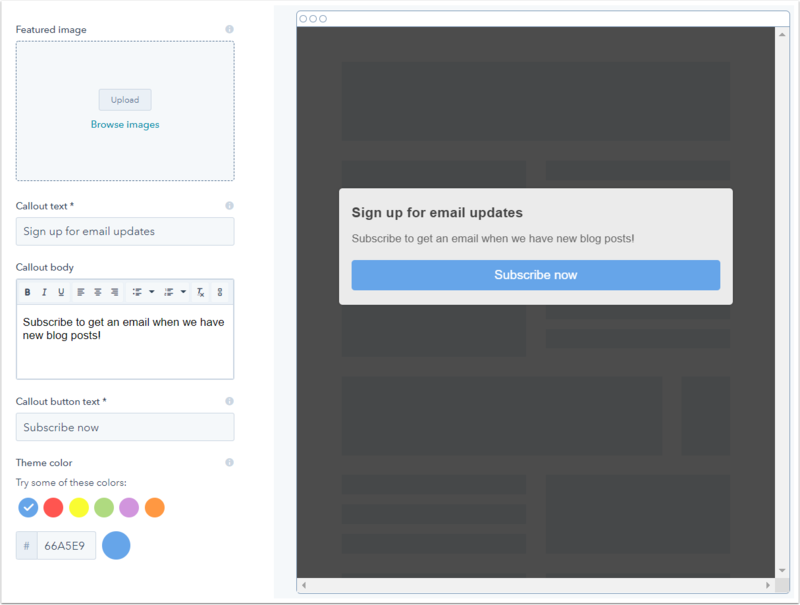 On the Preview tab, you can test an interactive preview of your pop-up form. To see how your pop-up form will appear on different devices, click the Desktop, Tablet, or Mobile buttons in the upper left. In the top right, click Publish to take your pop-up form live.